And the countdown begins…7 days until the release of P90X3! Woohoo! I am mostly a “workout in my living room” person (besides Bootleg Bootcamp, of course), and I have tried lots of videos that are out there. P90X was always one I personally had trouble sticking to, given that the workouts are 60-75 minutes, and it’s hard to squeeze that in every single day. This new workout is an intense 30 minutes a day, and I’m hoping that it will be a game changer. I fully intend to give it a shot, and looking forward to some cheesy Tony Horton jokes. Let me know if you’re interested in trying it with me! If I ask you, “What do you want out of life?” and you say something like, “I want to be happy and have a great family and a job I like,” it’s so ubiquitous that it doesn’t even mean anything. What’s more interesting to me is what pain do you want? This article is beautifully written, and a helpful reminder to me that sometimes my avoidance of going after the things I want is just a fear of the pain that may occur in the process. Unfortunately, life’s not all puppies and rainbows, and a lot of times to reach our goals, some suffering is involved. In a perfect world, we are lucky to just come across the right opportunity at the right time, or are blessed with good genetics, but I think most of us have to work pretty dang hard for the things that we want. Tom Hanks in a League of Their Own said it quite succinctly: “It’s supposed to be hard. If it wasn’t hard, everyone would do it. The hard is what makes it great.” Couldn’t have said it better myself. The pain is worth it. I made this recipe for dinner last Monday - but subbed out the soba noodles for spaghetti squash, and the peanut butter for almond butter. We generally avoid keeping pasta & noodles around because they tend to bloat me a bit - so I like using spaghetti squash as a healthy alternative - it is both high in fiber and beta carotene. If you are watching your carbohydrate intake, or avoiding grains, spaghetti squash is a great substitute. I am not going to sit here and say that it tastes just like pasta, but it does satisfy the craving, in my opinion. And the almond butter was just what we had on hand, as I generally prefer it to peanut butter (random fact: did you know that peanuts are actually a legume and NOT a nut?). We had some local farmer’s market peppers and onions from the weekend, so I used those up in this dish as well. I would have loved some more veggies in this, but it was still very filling! Budgetbytes.com is a great website for finding healthy meals on a budget. I highly recommend it for recipe ideas if you truly believe that eating healthy is not possible when money is tight. The author breaks down each recipe by cost per serving, which is very helpful. I hope you can find some inspiration there as well! Lately, I have been trying to limit my intake of grains (mostly gluten-containing grains), as part of a self-study to determine the cause of some bloating issues I have been having lately - I’ll save you the details of that since this is my first post here :). I also eat a lot of vegetables that may also be the culprit, but I am currently not willing to give any of those up, so for now, grains it is. 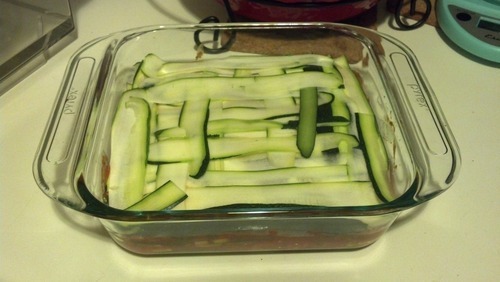 I’m not sure where I got the recipe for last night’s dinner, but at some point in my many wasted hours on Pinterest, I must have seen a zucchini lasagna recipe that piqued my interest. My creation, however, is likely an amateur version of some great recipe out there. Anyway, using a regular peeler, I basically shaved the zucchini into thin slices lengthwise, and created layers similar to the way you would using regular lasagna noodles. For the sauce, I sauteed onions, red bell peppers, and garlic, then added some organic marinara sauce, and seasoned with basil, oregano, and garlic powder. My husband and I are mostly vegetarian at home, so for protein we added some ricotta cheese to each layer, and topped with mozzarella. For some reason, I tolerate dairy quite well. I love this dish because I can really get tons of veggies in at one sitting, and do not sacrifice on flavor at all. 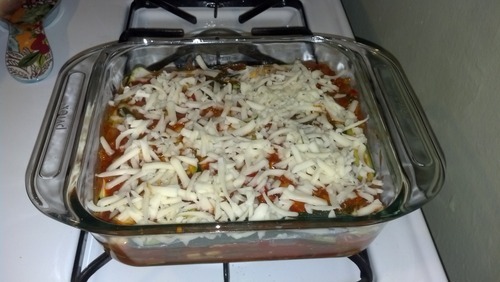 I would say it’s just as labor-intensive as any conventional lasagna - you just need a little patience with the zucchini. 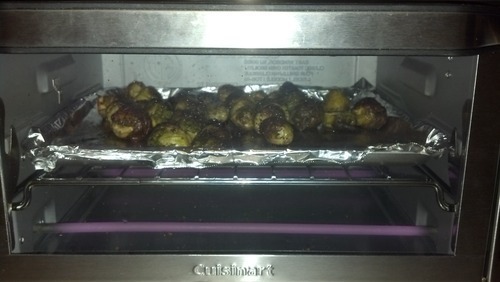 As a side, my husband cooked up some toaster oven Brussels sprouts, which are finally now available at our local farmers market! This is probably the most exciting thing to have happened to me all week. We like ours slightly overcooked on the outside, and melt-in-your-mouth on the inside. Success! What are you guys digging at the farmers market right now? I apologize for not sharing step-by-step recipes for these at present. I will work on that for future posts!